Warren is a detective who’s assigned the case. He’s been on personal leave because his wife died. His investigation turns up suspicions of lying, disturbing coincidences, and related homicides. 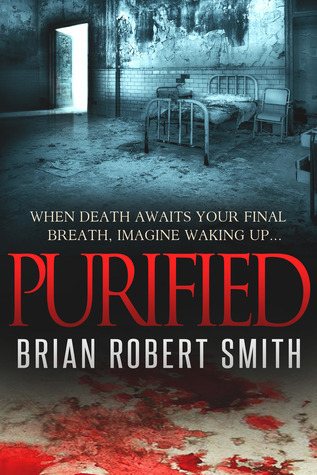 Purified – Do you ever dream of a life where no disease can harm you? Your body is immune to everything trying to attack it? This sounds great until you realize that you have to come to the brink of death in order to get noticed by the Purifier. The crazed ex-military doctor who started his own underground experiments. Even worse, you don’t know what is happening to you until you are already purified, you have no say in the matter. I originally picked up this book because it was July’s Book of The Month in a Goodreads group I am a part of. I saw the cover and was instantly intrigued. I know you aren’t supposed to judge a book by the cover, but I do it anyways. As a debut book for Robert Smith, it went very well. The beginning had a bit of a weird pace to it. There were a lot of really quick scenes. But after those first few chapters, it settled down and started to read at a nice pace. The story was really intriguing. It was new to me, I haven’t experienced a story like it before. It hooks you by making Mason’s struggle really interesting. You would think that having a second chance at life would make someone happy, but he hates it. He already lost his old life, and everything just keeps going downhill from there. There weren’t any dull moments, which was a definite plus, it just keeps moving along at full speed until the end. The characters were all pretty likable in their own ways, which made it an even more positive reading experience. I expect many good things to come from Robert Smith after this novel. Horror/Thriller fans should definitely give it a shot.